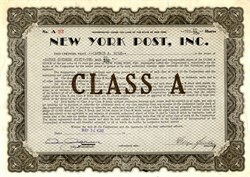 Beautifully engraved RARE uncancelled stock certificate from the New York Post, Inc. issued in 1940. This historic document was printed by the National Stationers and has an ornate border around it. This item has been hand signed by the Company’s President, and Assistant Secretary, and is over 71 years old. The New York Post is the 13th-oldest newspaper published in the United States and is generally acknowledged as the oldest to have been published continuously as a daily, although – as is the case with most other papers – its publication has been periodically interrupted by labor actions. Since 1993, it has been owned by media mogul Rupert Murdoch's News Corporation, which had owned it previously from 1976 to 1988. It is the seventh-largest newspaper in the U.S. by circulation. Its editorial offices are located at 1211 Avenue of the Americas, in New York City, New York. The New York Post, established on November 16, 1801 as the New-York Evening Post, describes itself as the nation's oldest continuously published daily newspaper. The Hartford Courant, which describes itself as the nation's oldest continuously published newspaper, was founded in 1764 as a semi-weekly paper; it did not begin publishing daily until 1836. The New Hampshire Gazette, which has trademarked its claim of being The Nation's Oldest Newspaper, was founded in 1756, also as a weekly. Moreover, since the 1890s it has been published only for weekends. In the summer of 1829, Bryant invited William Leggett, the locofoco Democrat, to write for the paper. There, in addition to literary and drama reviews, Leggett began to write political editorials. Leggett's liberal philosophy entailed a fierce opposition to central banking, a support for voluntary labour unions, and a dedication to laissez-faire economics. He was also an abolitionist and a member of the Equal Rights Party. Leggett became a co-owner and editor at the Post in 1831, eventually working as sole editor of the newspaper while Bryant traveled in Europe in 1834–5. In 1881 Henry Villard took control of the New-York Evening Post, as well as The Nation, which became the Post's weekly edition. With this acquisition, the paper was managed by the triumvirate of Carl Schurz, Horace White and Edwin L. Godkin. [ When Schurz left the paper in 1883, Godkin became editor-in-chief. [ White became editor-in-chief in 1899, and remained in that role until his retirement in 1903. In 1897, both publications passed to the management of Villard's son, Oswald Garrison Villard, a founding member of both the National Association for the Advancement of Colored People and the American Civil Liberties Union. Villard sold the paper in 1918, after widespread allegations of pro-German sympathies during World War I hurt its circulation. The new owner was Thomas Lamont, a senior partner in the Wall Street firm of J.P. Morgan & Co.. Unable to stem the paper's financial losses, he sold it to a consortium of 34 financial and reform political leaders, headed by Edwin Francis Gay, dean of the Harvard Business School, whose members included Franklin Delano Roosevelt. Conservative Cyrus H. K. Curtis—publisher of the Ladies Home Journal—purchased the New-York Evening Post in 1924 and briefly turned it into a non-sensational tabloid in 1933. J. David Stern purchased the paper in 1934, changed its name to the New York Post, and restored its broadsheet size and liberal perspective. Dorothy Schiff purchased the paper in 1939; her husband, George Backer, was named editor and publisher. Her second editor (and third husband) Ted Thackrey became co-publisher and co-editor with Schiff in 1942, and recast the newspaper into its current tabloid format. James Wechsler became editor of the paper in 1949, running both the news and the editorial pages; in 1961, he turned over the news section to Paul Sann and remained as editorial-page editor until 1980. Under Schiff's tenure the Post was devoted to liberalism, supporting trade unions and social welfare, and featured some of the most-popular columnists of the time, such as Joseph Cookman, Drew Pearson, Eleanor Roosevelt, Max Lerner, Murray Kempton, Pete Hamill, and Eric Sevareid, in addition to theatre critic Richard Watts, Jr. and Broadway columnist Earl Wilson. In 1976 the Post was bought by Rupert Murdoch for US$30 million. The Post at this point was the only surviving afternoon daily in New York City, but its circulation under Schiff had grown by two-thirds. Historian/activist Howard Zinn's parents introduced him to literature by sending 25 cents plus a coupon to the Post for each of the 20 volumes of Charles Dickens' collected works. The 1906 Old New York Evening Post Building is designated landmark.